Mr. Masataka Fujita, Secretary General of the AJC, conducted a keynote lecture at the inaugural Oita ASEAN Exchange Promotion Symposium held in Oita Prefecture, Japan on July 20, 2017. 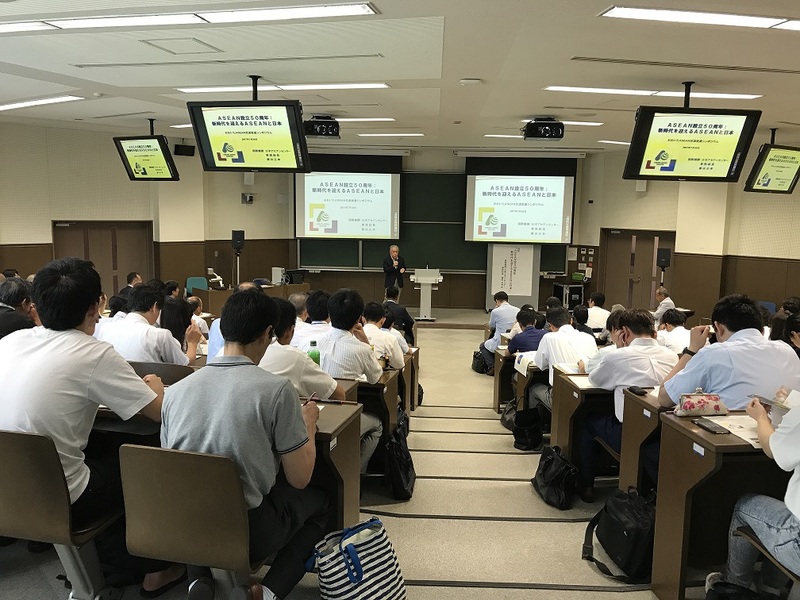 The symposium was organized by the Oita Exchange Promotion Council as its kickoff event, which was attended by some 120 participants. Following the opening remarks by H.E. Mr. Katsusada Hirose, Governor of Oita Prefecture, SG Fujita gave a lecture titled “ASEAN’s 50th Anniversary: ASEAN and Japan Embarking on New Era”. He summarized the ASEAN’s 50-year history, development of the ASEAN-Japan relations, with a particular emphasis on the ASEAN’s economic integration and its effect on Japan. The lecture was followed by a panel discussion themed on how to make Beppu, a city in Oita Prefecture, a hub of exchanges with the ASEAN Member States. Oita Prefecture has been selected as a training site for the “NIHONGO Partners” Program, a program organized by the Japan Foundation to dispatch Japanese citizens as “NIHONGO Partners” mainly to secondary schools in the ASEAN Member States in order to support the local Japanese-Language teachers and students. Also, as there are a number of students from the ASEAN Member States studying at the Ritsumeikan Asia Pacific University, which is located in Beppu city, Oita Prefecture is　trying to foster momentum for exchanges with the ASEAN Member States in association with the University. The Centre is always ready to support efforts by municipal governments to build and enhance network of exchanges between them and the ASEAN Member States.